Grow better soybean is a poster giving information on growing soybeans. It was produced in partnership with IntrioSynergy for a soybean campaign in Nigeria. It outlines practical steps for soybean production from land preparation to post-harvest. Grow better soybean flipchart is a 16 page flipchart giving information on growing soybeans. It was produced in partnership with IntrioSynergy for a soybean campaign in Nigeria. It outlines practical steps for soybean production from land preparation to post-harvest. A3 flip chart explaining how to inoculate soybean. Produced at a write-shop in Kenya facilitated by ASHC. 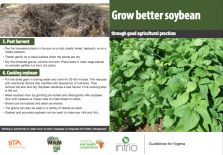 Double soybean yields, increase income is a n A3 poster produced at a write-shop in Kenya facilitated by ASHC for farmers in Zambia.